Westport Lion members that visited the Elgin Lions from left to right are: Marty Hawkins, Michael Harris, Harry Beckett, Dave Blair, Jim Scala and Wayne Bent. The Elgin and Westport Lions Clubs’ Medical Mobility Service (MMS) program had a very successful year in 2018. 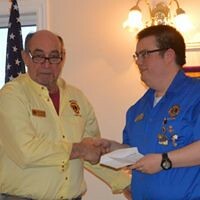 The Elgin Lions graciously hosted 12 members of the Westport Lions Club to hear a yearly report on the status of their shared Medical Mobility Service. Lion Jim Scala introduced the members of the MMS board and their responsibilities. 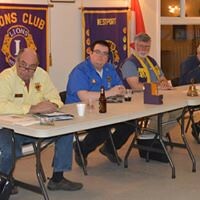 Lion Wayne Bent is sitting club president. Lion Dave Blair looks after all maintenance and care of the vans and the garage. Lion Michael Harris is responsible for dispatching drivers for all medical appointments. Lion Jim Scala is in charge of all financials related to the operation of the program. 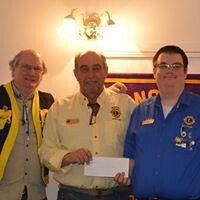 Because the MMS is a joint partnership between the Elgin and Westport Lions Clubs, Lion Ted Dwyre is the Elgin Club’s representative. Lion Wayne Bent started the presentation with a brief history of the program. The history was outlined in a Review-Mirror article on November 16, 2018. If you are interested in reading the history of the program, go to the Westport Lions’ website, (westportlions.ca), and click on Latest News. Presently, the MMS has six volunteer drivers and six Lions members that handle all the medical requests. All the drivers are given first aid training and instruction in the use of MV1 wheel chair safety and ramp use. Lion Dave Blair outlined his responsibilities regarding the routine maintenance of the garage and vans. Dave also detailed the changes that have been made to the garage to accommodate the two mobility vehicles and the tractor for snow ploughing and grounds maintenance. Dispatcher Lion Michael Harris reported that 281 medical requests were fulfilled in 2018. This resulted in 26,635 kilometers driven which required 915 driver hours. That works out to approximately 94 kilometers per trip. A total of 42 people used the service, 29 from the Westport area and 13 from the Elgin area. HST rebate on vehicle purchased. 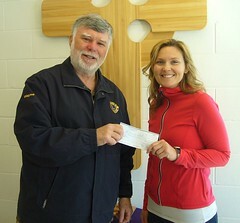 Thank you to all of our generous benefactors. The bottom line is that in 2018 the MMS had a net profit, which will be set aside for the purchase of a replacement vehicle sometime in the future. The continued collaboration of the Westport and Elgin Lions Clubs, combined with the tremendous support of the North Leeds community, executive, and drivers will guarantee the future success of the Lions Medical Mobility Service.